Okay, time to finish up my 2-part installment on my recent short-lived visit to Venice, Italy. I know you'd probably rather I get back to the Paris scene, which is probably what brought you to this site, but I don't want to neglect 'and beyond.' Don't worry, a lot of Paris stuff coming up, including Anahuacalli and Le Caillebotte. So stay tuned. If you read Part 1, you might have gotten the impression that I was pretty fed up with eating out in Venice after having such a difficult time finding restaurants on my list that were actually open for business, that I just stuck to drinking, and ended up falling in the extremely poorly secured drop-off points along the canals. Well, the good news is that I didn't forget the bottle and I didn't fall in. What more can one ask for? How about a decent lunch? 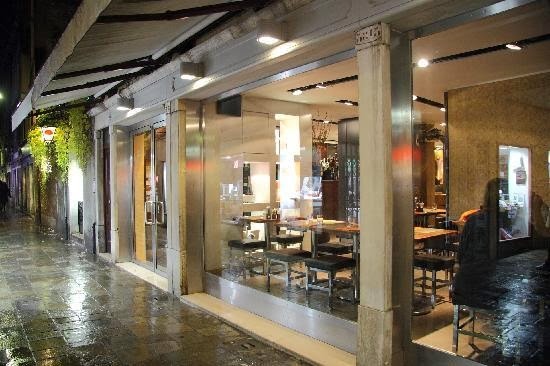 Following my aforementioned failures to grab some cibo at Al Vecio Pozzo or Ristorante Ribot, I trekked on over to the apparently highly-regarded Impronta Cafe - on my 'go to' list and recommendation #2 for my hotel concierge. 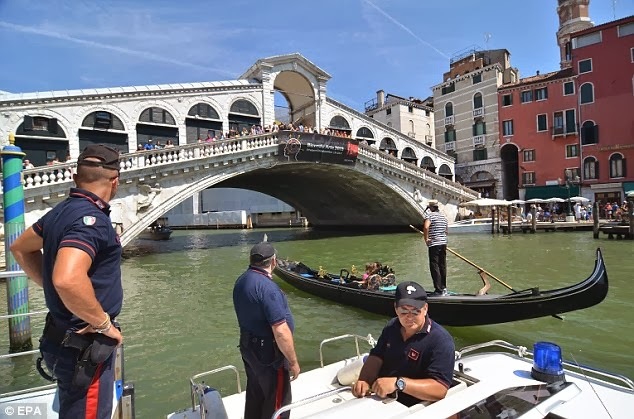 I had plans to have dinner there, but desperately seeking a venue for lunch, the hour getting late, I figured I'd worry about dinner when I came to that bridge, and bridges are certainly not hard to find in Venice. 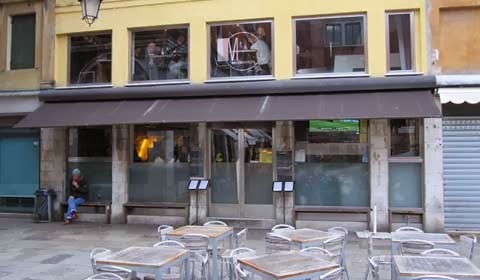 Rather modern looking by Venice standards, I had the impression this was more of a non-touristical trendy spot than one is apt to find on the way to the Ponte Rialto. Having learned my lesson the night before regarding primo and secundo platos - too much, cheri - I opted for one pasta dish and dessert. 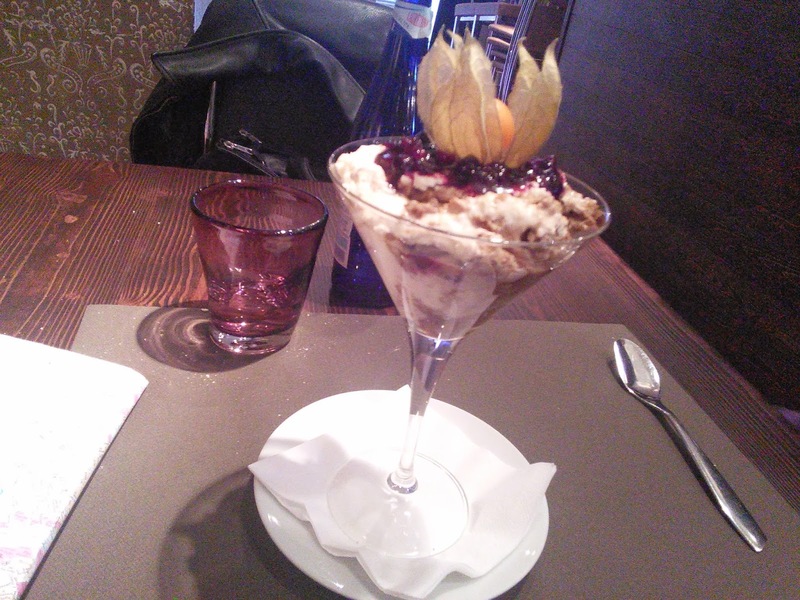 Both were mighty fine, starting with the tagliolini neri, black pasta with almonds laying in a sauce that I have now forgotten (15€) and followed up by a homemade tiramisu with fruit from the woods (6€), which was delicious, but for my taste, too fruity. 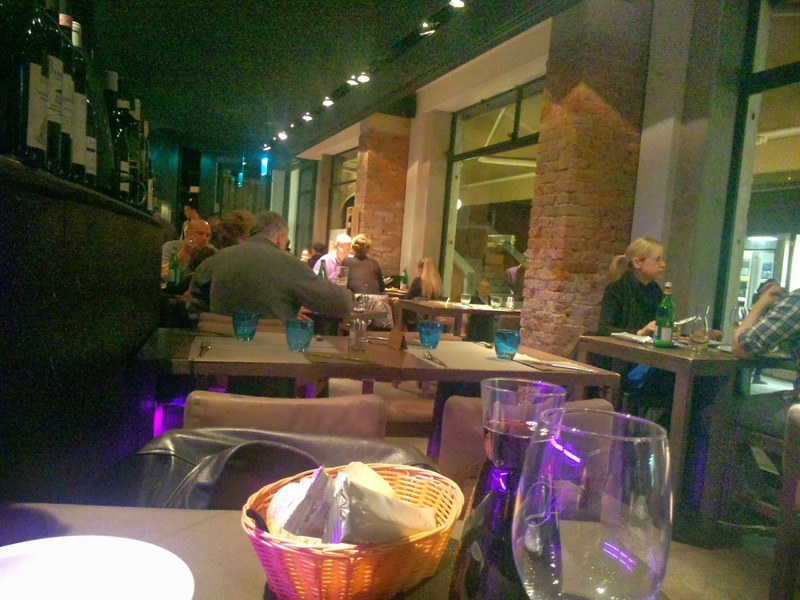 Topped off with a glass of house red (3.50€) and an espresso (2€), the bill came to a not-so-cheap 31.92€. Impronta has a kind of deli-style counter running along one of the walls where take-out of sandwiches, breads, and desserts is possible. I hate to say that this nearly ruined my lunch. A mother and her young son spent a good half hour between my table and the counter doing the sorts of obnoxious mother/child stuff that might be appropriate at the playground, but not beside one's table when you're trying to chill out from wandering aimlessly in a foreign city trying to figure out where one is. After a while, they really got on my nerves, the kid doing all those things that civil French hate about kids, especially kids in restaurants/cafes - acting cute, acting out, goo gooing with the mother, spilling food on himself, and, well, just plain being a kid in a restaurant. Eventually, my ornery-side got the better of me and I turned to the mother and in my chillingly hostile voice informed her that I was trying to eat. She seemed to have gotten the message, but just as quickly was back to acting all obnoxiousy mothery again. When she finally left, she turned at the door and bid me adieu, which nearly brought a smile to my face. One more to tell you about, dinner at Ristorante Muro. Even further along the yellow brick road on the way to Ponte Rialto, after lunch at Impronta, I stopped in at Muro, another one on my list, and reserved for later that evening. This was a Friday night, and by the time I was into my meal, the place was pretty packed with a mutti diverse clientele. I must admit, I had a pretty good feeling about Muro when I stopped by at lunch time - it was quiet, yet busy, subdued lights, decent staff. When I got there for dinner, oddly, it seemed brighter and less formal than my first impression. I was seated at a small table near the back and, although my server kept forgetting to inform me of the night's specials, he turned out to be pretty helpful. And I certainly enjoyed the meal, the best I've had in this young year. 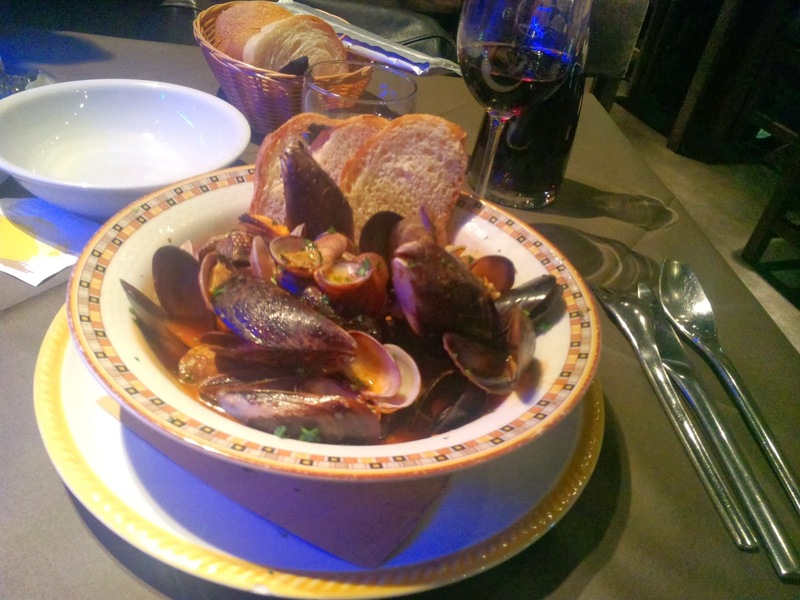 I started off with a bowl of mussels and clams, Pepata di Cozze (12€). Man, this was good. The sauce was spiffed up with garlic and lopped up with the toasted bread. When I commended the dish to the server, he opined, 'the best is yet to come,' and he was correct. 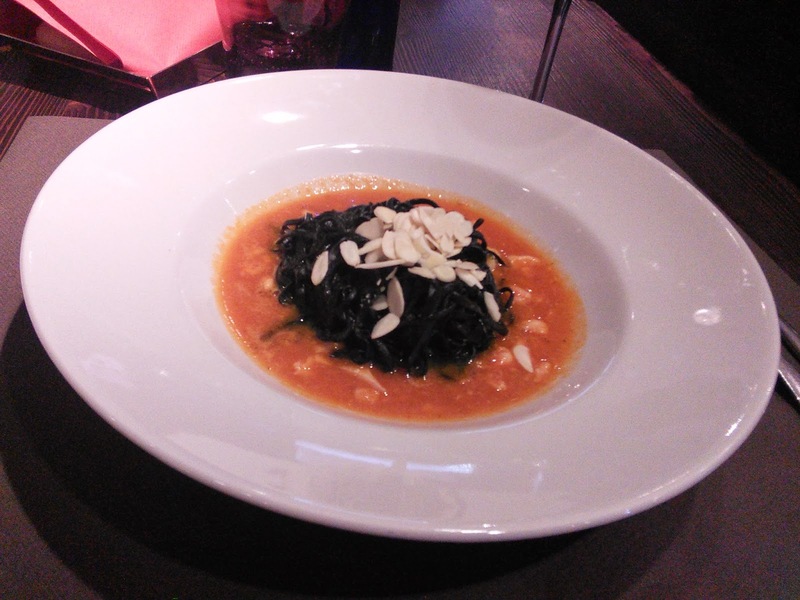 I ordered the special - spaghetti and lobster Primo del Giorno (20€). I had been tempted by the whole grilled fish, but the price by the kilo looked risky. I shied away from the grilled seafood platter after my disappointing plate the night before at Osteria ae Cravate. 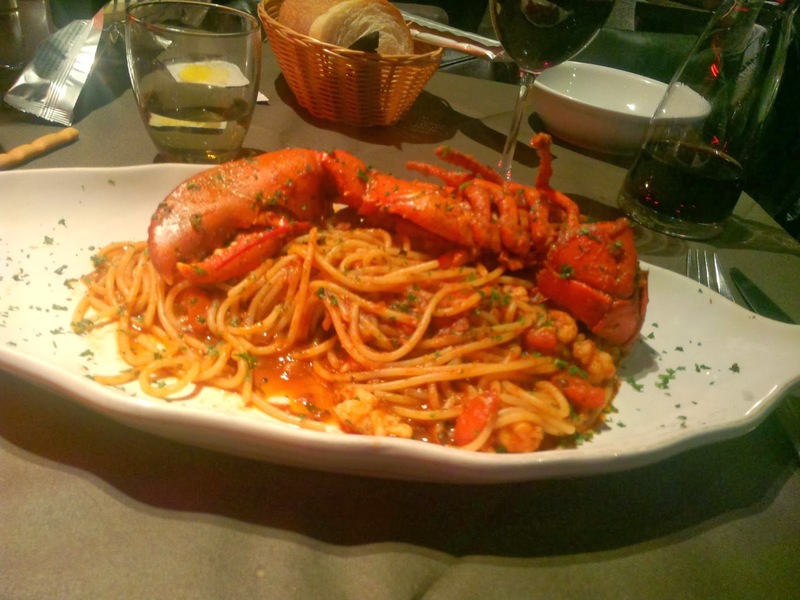 The Primo, though, was superb, with a half lobster to go along with spaghetti with shrimp and tomato that was spiced up by something akin to the great Old Bay seasoning, but less salty and a bit spicier. Encore. 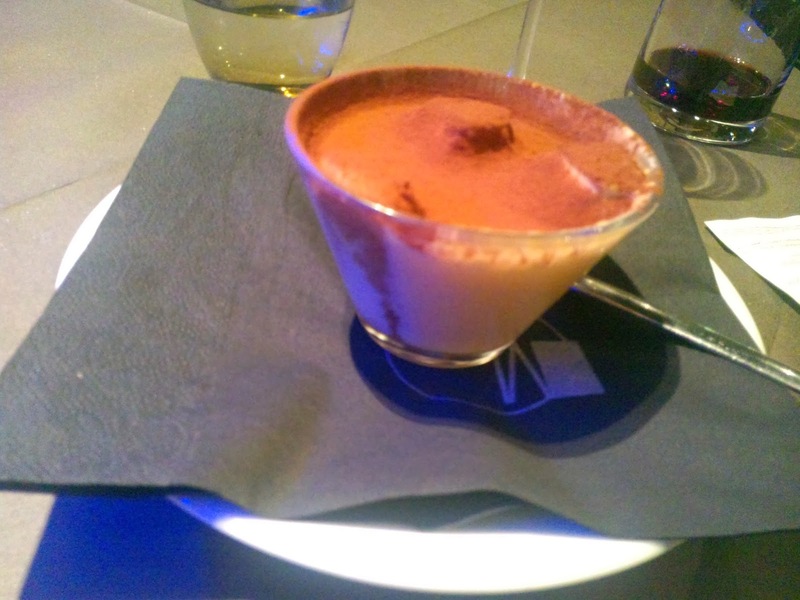 Nothing much appealed to me on the dessert menu, so I opted for the tiramisu(5€) again - also homemade, simpler and better than the pretty decent one I had earlier in the day at Impronta. Muro doubles as a pizzeria, and pizza was a big calling card at several of the tables during my visit. Just sayin'. The tab, including a half carafe of red came to paltry 49€ - can't argue with that. Muro may not be on the lists in all the guides, but I heartily recommend it, so there. Just to add, I was among the guests at another dinner at the Casino of Venice. It was a pretty good meal, featuring some decent artichokes, which is about all I can remember, so the wine must have been pretty good, too. I did have a chance to wander to the casino part of the Casino with a couple acquaintances, fully armed with my free 10€ chip and admission paper (following the vetting of my passport). Hello, David Lynch. No Sharon Stones throwing chips in the air - this place was somber. There were several adjoining rooms housing roulette and baccarat tables and populated by cigar-smoking Italian ghouls and their gals. I placed my chip on a roulette table and left without it about 10 seconds later. Back out into the night, free shuttle boat back to the Palazzo Roma, and I got back to my hotel without falling into the canal. Goodnight.